In 2013, the Finnish state railways (VR) and Siemens singed a contract for the delivery of 80 new locomotives. There is an option for 97 more units. The machines will have 6.4 MW duration power and a top speed of 200 kph. The electric locomotives will have two additional diesel engines fur shunting and services on non-electrified track sections. These new machines replace the VR Sr1 series. The first new machines arrived in Finland in 2016. Series delivery commenced in April 2017. The Vectron AC locomotive for the Finnish railway company VR Group (Railcolor series Sr3) has been authorized for operation in Finland by Trafi, the Finnish Transport Safety Agency. The first eight Vectrons will immediately enter commercial service today. Today, the first commercial operation will start from the City of Tampere and end at the Vuosaari harbor in Helsinki. Siemens will be delivering a total of 80 locomotives to the VR Group. This is the first order for a broad-gauge configuration and at the same time the biggest single order for the Vectron to date. All locomotives are to be delivered by the end of 2026. For testing and certification of the extensive new equipment package for Finland, up to five locomotives have been undergoing type tests according to the Technical Specifications for Interoperability (TSI) since early 2016. Various additional functionalities and equipment packages were certified, such as the broad-gauge bogies, the special winter package and the two diesel power modules for bridging short stretches without an overhead power line. The VR Group ordered the Nordic version of the Vectron in February 2014. The locomotives have a maximum output of 6.4 MW and a top speed of 200 km/h. The bogies are designed for operating on 1.524 mm broad-gauge lines. The locomotives will be used in Finland and are equipped with the European Train Control System (ETCS) as well as the Finnish JKV-STM train control system. The locomotives will have the series designation Sr3. The Vectrons are specially equipped to operate under harsh Nordic winter conditions in Finland, such as frequent collisions with larger animals, temperatures as low as 40°C below zero and powder snow. To handle these conditions, the locomotives are built with cavity roofs and a reinforced front hatch. Other special features include side buffers and automatic couplers. Timber is frequently transported by rail in Finland and trains are moved in and out of forests on non-electrified rail lines. The Vectron accomplishes this with two diesel power modules and on-board radio remote shunting controls. With this system, there is no need for separate diesel shunting locomotives. Watch the extra large Vectron locomotive while pulling test trains, shunting and running in diesel mode (from 7:30). After spending its first months of existence as a normal gauge locomotive in central Europe, VR's 3301 is now ready to go to its final destination, Finland. Now with 1524 mm bogies, in stead of 1435 mm ones, it is going northbound on loco buggies. Thanks Norman. Never enough Finnish Vectron news. Today we continue the journey of VR 3303 and 3304 in Finland. The images show both machines on their way to the Ilmala depot in Helsinki. Their journey started from Hanko harbour at the southernmost tip of Finland. Composition of the train: diesel locomotive Dv12 2537 + measurement coach A17 + Sr3 3304 + Sr3 3303. Thanks Tuukka. It was a VR Vectron themed weekend. We still owed you the images of the most spectacular transport that took place on 13 and 14.05.2016: RailAdventure 103 222 with VR Sr3 3303 and 3304 on its way from Munich to Rostock harbour. Both locomotives on the welknown loco buggies. Thanks to Tim Roux, Norman Gottberg, Jan-Felix Tillmann and Marcus Schrödter. With 3301 being transported to Munich on Friday, and no's 3303 and 3304 on their way to Finland this weekend (images come tomorrow! ), 3302 can not stay behind. The image above, made by Tuukka Varjoranta, shows the machine with a timber train (Pasila freight yard - Joutseno) passing Ohkola on the Kerava-Lahti high speed line. Sr1 3081 serves as back-up. Railadventure 103 222 brought VR 3301 back to Munich today. The machine was in Vienna for climate tests. Thank you Ludwig GS / Hans Paulus. Tuukka Varjoranta sent us an report from Finland about the Finnish Vectron homologation project. We see VR Sr3 3302 with five Eil coaches and test bed locomotive 193 971 (only in bottom picture). The composition was on its way on the Sköldvik line near Martinkylä and the Vuosaari harbour line. Leaving VUZ Velim. VR Vectron no.3301 as seen yesterday by Jirka Štembírek. Diesel mode, electric mode. The Finnish VR Vectron no. 3301 is tested extensively at the VUZ Velim test center in Cerhenice (CZ) right now. Siemens 193 930 (also with shunting diesel module) is assisting. Images were all made last weekend by Dalibor Palko and Normann Gottberg. Indeed, we did cover the transport of a Finnish locomotive to the Czech Republic, yet. Last Saturday, Railadventure took the future VR 3301 from Munich to the VUZ Velim test centre (CZ). It is the second locomotive of its type to leave the factory after no.3302 was transferred to Finland early January. Joona Aspegren provided these pictures of VR's Sr3 3302 being transferred from Hanko to Helsinki depot, pulled by Finnish diesel locomotive Dv12 2640. Hybrid locomotive no.3302, the first Vectron for VR, has arrived in Finland. Thanks to Juha Mannila for the footage. Weekend? A new year? Holidays? Not for Railadventure. Finland can prepare itself for the arrival of the first Sr3 locomotive this week. This morning locomotive no. 3302 left the Siemens factory in Munich on loco buggies, in a train pulled by 103 222. Thanks to all photographers! This Finnish news site brings us a complete image report on building the new Vectron locomotives for VR Group. The Finnish railways will get 80 hybrid locomotives (electric + two combustion engines) of this design. First commercial services are planned for 2017. The report also gives away that another Vectron DE is under construction and that soon there will be Vectron locomotives in red and gray. Now there is also a video. A good morning at the depot of Finnish Railways in Helsinki: The Vectron 193-971 test locomotive is ready for its next test trips. In the background: "Sm1" light rail trains. Vectron-veturi matkalla Suomeen from VR Group on Vimeo. Must see: One of the best railway videos we've seen recently, published by the Finnish railways. It shows the complete transport of Vectron 193 971 from Munich to Helsinki. Dynamic, stylish. On 07.04.2015, Siemens 193 971 was on display at Helsinki Central Station. First, invited guests had the possibility to enter the locomotive, later on, the machine was open to the general public. After the event, the machine was brought back to Ilmala depot by VR Sr1 3087. Update: images of lifting the 193 971 of its Loco Buggies that were used to transport the locomotive in Germany. Siemens Finland and the Finnish railways (VR) have set-up a new website dedicated to the introduction of the new, 3rd generation electric locomotives. There you can learn about the main characteristics of the machines an the time schedule of its introduction. Most interesting for us that Siemens also released a new artist impression of the design of the machine. It still features the Vectron cab design, but with a different front design. The livery is now green with a grey (or silver?) top and white striping and logos. As these machines will get two additional diesel engines, a new roof construction is being developed for the mid section. 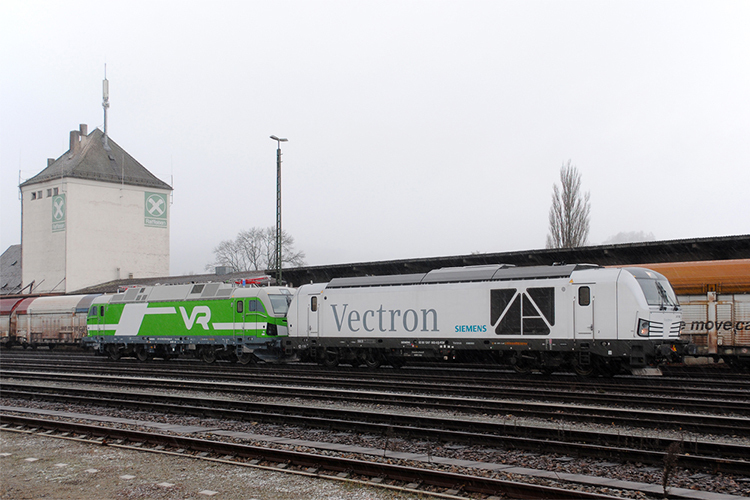 In the past months, Siemens has prepared to first Vectron locomotive for test runs in Finland. As from 2017 Siemens will deliver 80 hybrid locomotives (+97 option) to the Finnish state railways (VR). Of course, this requires extensive testing. Siemens wants to take out every risk. Finland has completely different climatic conditions which the new machines need to endure effortlessly. Temperatures as low as –40 °C should be no problem for both diesel and electric engines of the machines. Today, a new Siemens stock locomotive left Munich, bound for the harbor of Rostock, numbered 193 971. At first sight it is 'normal' electric Vectron AC locomotive, but as you can see it is placed on bright yellow colored 'loco buggies'. Finland has a different track gauge, 1524 mm instead of our 'standard' 1435 mm. So this Vectron has a wider track gauge and needs the loco buggies for transport in Germany. The white 193 971 is decorated with stickers commemorating the 160 year long history of Siemens' presence in Finland. The company's relation with the country dates back to 1855, when Siemens built its first telegraph line in Finland. Additionally, the locomotive sports the slogan 'Vectron kotonaan suomessa', in English: the Vectron at home in Finland. To prevent that people will misinterpret this item: Siemens has pointed out today that this locomotive is not part of the final batch for the Finnish railways. They call the 971 an 'advanced locomotive for testing purposes'. Railcolor: Siemens has released a first impression of the Vectron for the Finnish railways. What we see is a locomotive that looks like the Vectron machines already in service. The front design is identical. It's livery is based on the current 'green' corporate design of VR, developed by UK based Design Bridge. Update: The front section maybe similar to the other Vectron version, the main body is quite different. The VR Vectron has mirrors, and a high center roof section. As it is also a diesel locomotive, it probably will have extra equipment on its roof. The Finnish Railways VR Group intends to place an order for 80 electric Vectron locomotives with Siemens worth more than 300 million Euros. This is the largest rolling stock investment ever made by VR Group and the second-largest purchase in Europe this year. The order will include an option for an additional 97 locomotives as well as the maintenance of the locomotives over a period of 10 years. The contracts will be signed in the very near future. The new locomotives designed to operate on broad gauge tracks are scheduled to be delivered one after the other from 2016. The first electric locomotives start operational services in 2017, and the entire fleet will be delivered to Finland by 2026. In both freight and passenger transportation they will also replace the existing Soviet-type locomotives, some of which were built in the 1970s. "For Siemens this marks the largest single contract so far for its latest generation of Vectron locomotives and the first for this type in the broad gauge version", emphasizes Jochen Eickholt, CEO of the Siemens Rail Systems Division. The electric locomotives will be manufactured at the Siemens plant in Munich, Germany, and the bogies at the Siemens plant in Graz, Austria. The locomotive also has two diesel engines. Changes to the air intake and chassis of the locomotive make it possible to operate in snowy and icy conditions. The locomotive can operate in temperatures of up to –40 °C. The agreement between VR Group and Siemens will be finalized in early 2014. After the agreement has been finalized, production, thorough testing and acceptance procedures will begin. The first ten locomotive batch will, according to current estimates, arrive in Finland in 2017. Large scale serial production will start in 2018. The new machines will replace the VR Sr1 series entirely.